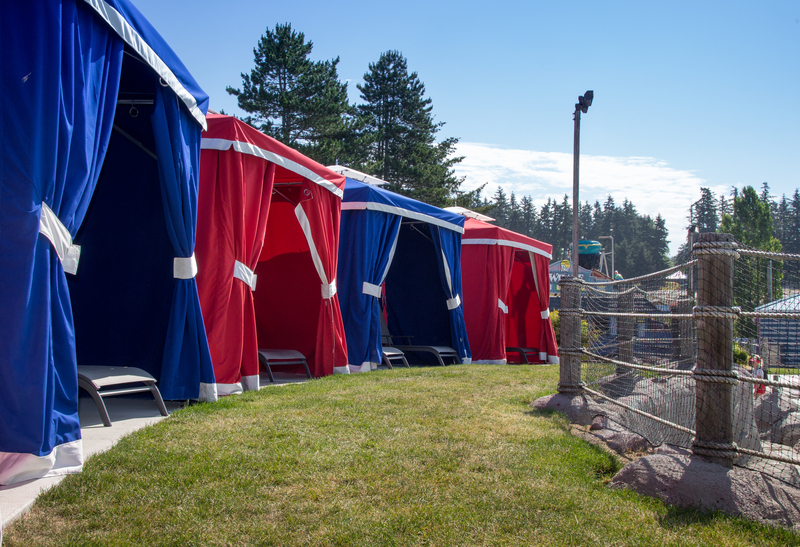 Relax in your own private cabana during your visit to the park! Cabana reservations are available on a first-come, first-serve basis online, or at the park the day of your visit. All cabana packages accommodate 4 guests (park admission excluded). Additional guests can be added to the cabana rental (up to 4 guests), for a total of 8 guests in The Villas or The Bungalows. All cabana rentals are only valid on the selected date indicated during the reservation. Reservations for Cabanas are final. There are no date changes, refunds, rain checks, or exchanges offered. The option to add on an additional 4 guests (for a maximum of 8) is $10 for each additional guest. The option to add on an additional 2 guests (for a maximum of 6) is $20 for each additional guest. The option to add on an additional 4 guests (for a maximum of 8) is $25 for each additional guest. Food must be ordered by 4:00pm from the Cabana attendant. Orders placed after 4:00pm will not be filled. NO refunds on meal deals for missed orders. 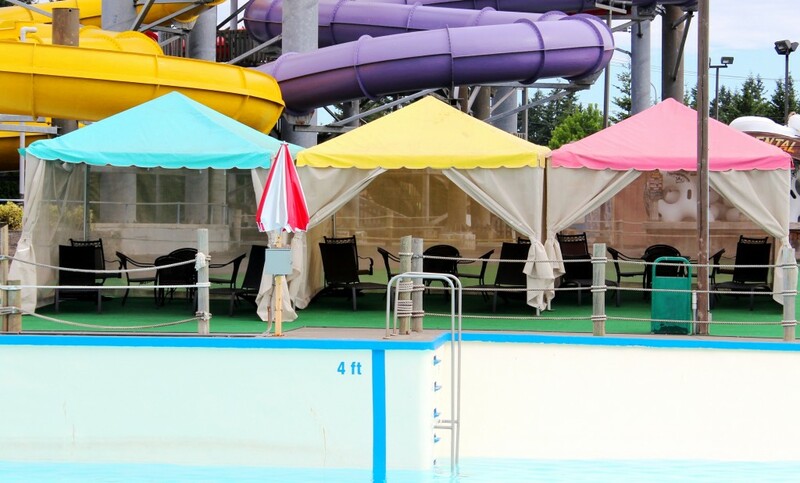 Park admission is an additional cost, and not included in the Cabana package price. Cabana reservations are available daily from open to close (based on availability). Cabana rental price is for the day, and will not be pro-rated for early departure or late arrival. Guests with online reservations must check into their cabana before 2:00pm on the day of reservation. Reserved cabanas are released at 2:00pm for on-site reservations. Guests must check-in upon arrival at The Oasis Cabana Booth, located just inside the turnstiles between the entrance and exit gate. Each cabana guest will receive a wristband, which must be worn at all times, in order to gain entrance to the Cabana area. Wristbands are non-transferable. Please note - there may be a $5.00 replacement fee for lost or stolen wristbands. Cabanas are reserved on a first-come, first-serve basis via online reservations. 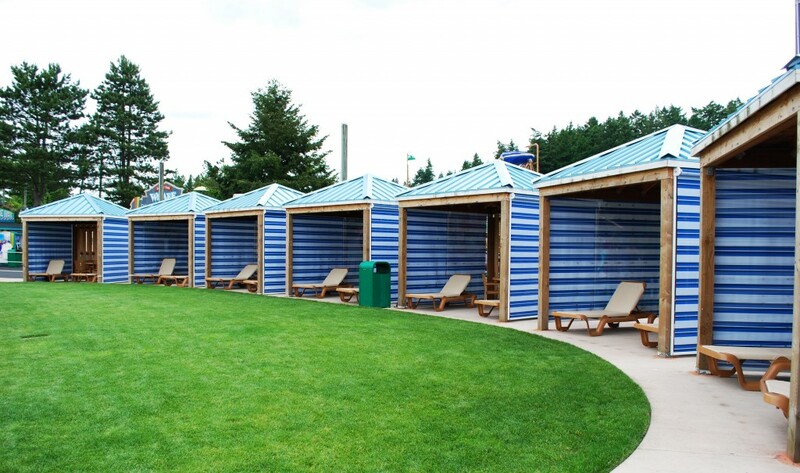 Remaining cabanas may be rented on-site after 2:00pm at The Oasis Cabana booth on a first-come, first-serve basis. Guests must check-out with the Cabana attendant upon departure. Items left in the cabana upon park closing will be turned into Guest Relations. Wild Waves Theme Park is not responsible for items left unattended in the cabanas. Online reservations are paid in advance. Reservations are non-refundable and non-transferable. Villa Cabana lockers are for day-use only. Credit cards will be charged for lost keys. Towels and sunscreen are available for purchase through your concierge cabana team. Please note that Park admission is additional and not included in the Cabana package price. No outside food or beverages allowed in the park. Wheelchair accessible cabanas are available, please give us a call to inquire.